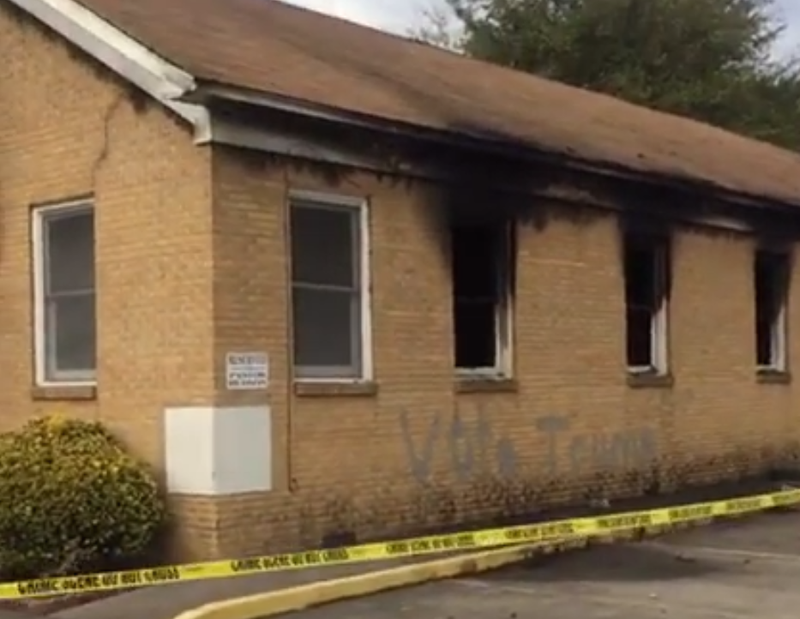 The side of the Hopewell Missionary Baptist Church shows a badly burned part of the building, as well as the words “Vote Trump” spray-painted on the building’s side. A GoFundMe campaign set up to help repair the Hopewell Missionary Baptist Church in Greenville, Miss., which was set on fire earlier this week and marked with "Vote Trump" written in graffiti, has raised $201,823 as of Friday morning, exceeding its original $10,000 goal. Some 5,755 people contributed money toward the cause. About 80 percent of the church was destroyed in the blaze, with the main sanctuary and pews left charred. Parishioners were stunned by the apparent attack but vowed to rebuild. The church is a historic church, having existed for 111 years. According to ABC News, the campaign's organizer, Blair Reeves, is "blown away" by all the support that has come pouring out toward the church. "Donations are coming in from all over the country," Reeves told the network. Reeves, who is actually from New York, said that he has no ties to the church but felt "compelled" to create the campaign because of the same kind of monetary support that was given to a North Carolina Republican Party field office after that office was firebombed. "The animus of this election cycle combined with the potent racial history of burning black churches as a political symbol makes this event something we must not ignore. Only two weeks ago, the internet came together to help repair a North Carolina GOP field office that had been burned by thugs. Justice demands we do the same now," Reeves wrote in the campaign description. ABC News notes that Bishop Clarence Green of the Hopewell M.B. Church "has been added as the beneficiary" of the campaign and "only he can withdraw the funds," according to GoFundMe regional communications manager Kate Cichy. Cichy also said that "GoFundMe campaigns can continue to accept donations after the goal is met and Bishop Green has access to the full amount." As the church looks forward to rebuilding, the FBI has opened a civil rights investigation into the arson and vandalism of the historic church. FBI spokesperson Brett Car said that it was still too early to determine if the blaze was indeed a possible hate crime, but some politicians and residents are already convinced.